The beauty of the surrounding Ozark region and the steady flow of clear water from the many springs attracted settlers to the Montauk area in the early 1800s. These same natural resources entice visitors to this secluded area today. The springs in the northern end of Montauk State Park combine with tiny Pigeon Creek to form the headwaters of the famed Current River. 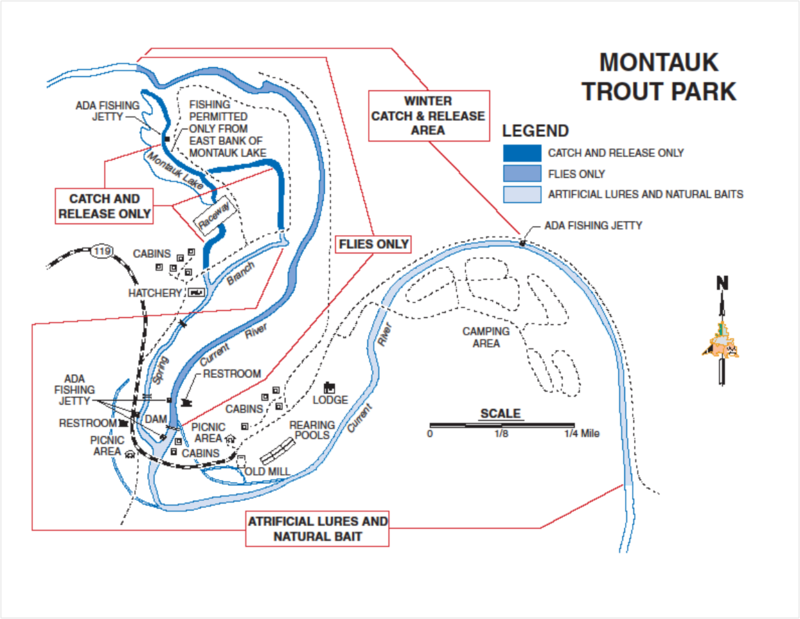 The park attracts anglers for the outstanding trout fishing, and vacationers flock to Montauk during the summer months to enjoy the variety of outdoor activities available in the park and the surrounding region. Trout fishing is permitted in accordance with the state wildlife code and posted restrictions daily from March 1 through Oct. 31, and during the winter catch-and-release season from the second Friday in November to the second Monday in February on Friday, Saturday, Sunday and Monday only. Each angler shall display a daily trout tag purchased on the area and bearing his or her signature. Each angler shall have a state fishing permit except those 15 years and younger or Missouri residents 65 years and older. Each angler shall keep their trout separate at all times and identified with their name and address. Daily limit is four, all brown trout must be equal to or greater than 15�. There is no length limit on rainbow trout. Possession limit is 8 trout. Only a single pole or rod may be used. Gigging, snaring or snagging is not permitted. 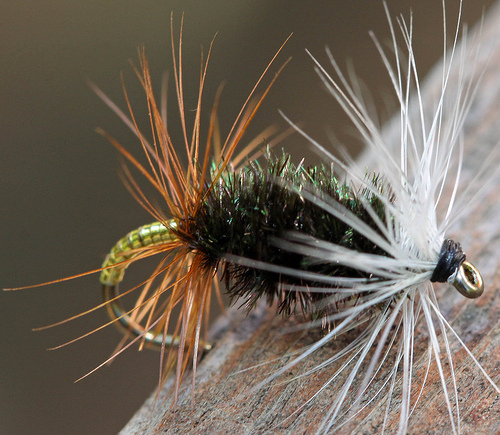 No person shall continue to fish for any species in these trout waters after having four trout in possession. The use of game fish or parts thereof for bait is prohibited; chumming is not permitted. Anglers need a fishing permit, unless exempt, as well as a daily trout tag. The daily trout tag is $3 for adults and $2 for those 15 and younger. 1. - is a catch-n-release area that is Montauk Lake and the small narrow stream up to the service road. 2. 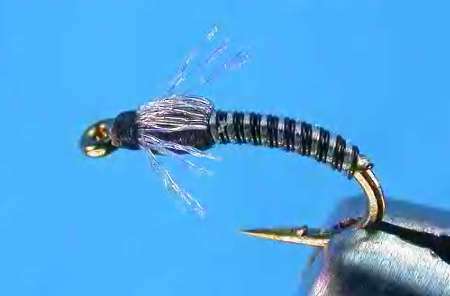 - Montauk springs to the dam is fly fishing or spin fishing with a single barb hook. 3. - Montauk Dam to the end of the park. Any bait can be used. Montauk Spring Branch is also part of Zone 3. Montauk Lake Trail (.8 mile ) - (Allow 25 minutes roundtrip) This trail is a level surface that has both paved and gravel portions. The road is used for stocking trout and unauthorized motor vehicles are not allowed, making it a safe place to stroll. The beginning of the walk crosses the bridge over the spring branch. To the left is the catch and release fly fishing area and the trout-rearing pools are upstream. Near the handicapped fishing access, the waters of Bluff Spring flow out from the base of the stone cliff. The spring supplies the water for the trout rearing pools, the hatchery and the wetlands. The trail offers excellent opportunities to view wildlife, including bald eagles, ducks, otter, deer, armadillo, bobcats, rabbits, belted kingfishers, great blue herons, beavers, muskrats, mink and a host of other aquatic creatures. The hike goes by Montauk Lake, which is fed by what looks like boiling springs of sand. The trail loops by the start of the Current River, then back to the naturalist�s office. Paved Bicycle Trail (.1 Miles) - (Allow 5 minutes) This is a short, level trail that is lighted and has a bench by the banks of the Current River. The trail runs from the bridge over Current River near campground loop 1 to Montauk Lodge. Pine Ridge Trail (1-1/2 Miles) - (Allow 1 hour 30 minutes) This trail is not a continuous loop but is in a "C" shape with two trailheads. The hike starts near the stone shelter, crosses the foot bridge and heads uphill into the 40-acre natural area. The area presents an example of mature pine-oak-hickory forest. At the top of the hill, the trail levels out and crosses Highway 119. It continues through stands of shortleaf pines, the only pine native to Missouri. The trail crosses the road again and gradually descends. After crossing a wood foot bridge, the trail heads back up a steep grade to a summit with scenic views, before winding back to the naturalist�s office. Take a tour of the historic mill, which is more than 100 years old. This historic site was a vital part of the Montauk Community into the 1920s. Built in 1896, the �Old Mill� had elaborate milling machinery. Much of it is still located there. Free guided tours of the mill are given on weekends. Hours vary, depending on demand and scheduled group tours. New schedules are posted each week showing times and dates for available public tours. For information regarding tours or to schedule a special group tour, contact the park naturalist at 573-548-2207. You can attend a variety of interpretive programs from March through October, including nature walks, live animal demonstrations, evening programs, nature games, nature crafts, storytelling and mill tours. Program schedules are posted on bulletin boards in the campground, picnic areas, the lodge, mill and naturalist�s office. Programs are one hour or less (unless otherwise noted), free of charge and do not require reservations. Parents should accompany children to programs. For a overview of Montauk Springs State Park and the Current River click on the picture of the park sign. Early residents came to the area from New York and named their first post office after Montauk in Suffolk County, Long Island. Because of its proximity to the springs and its abundant supply of water power, the village of Montauk proved to be an excellent spot for milling. A total of four mills served the community at various times. The last, a gristmill built in 1896, still stands in the park. The mill contains most of its original machinery and is open to visitors during much of the year. 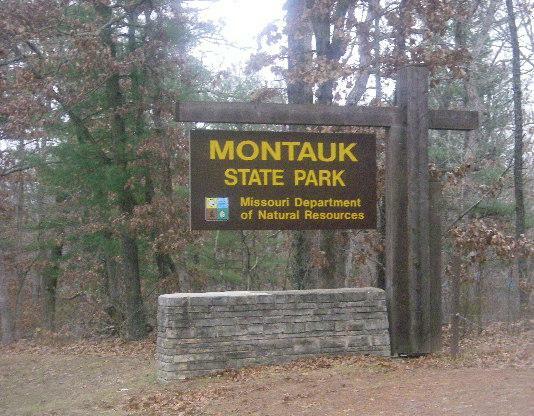 Since its acquisition by the state in 1926, Montauk State Park has been one of the most popular vacation spots in Missouri. It is one of three Missouri state parks known for fine trout fishing. Enjoy breakfast, lunch and dinner in the park's full service restaurant inside the Dorman L. Steelman Lodge. The Saturday evening special is prime rib. Reservations are not necessary. The park offers single, duplex and four-plex and one and two-bedroom cabins, sleeping cabins and motel rooms. Lodging is available year-round. To inquire about availability or reservations, call 573-548-2434. Reservations are not accepted via e-mail. Lodging is also available at Reeds Cabins inside the park. All campground loops are open and reservable year-round. The campground showerhouses and coin-operated laundries are open daily from Feb. 25 through October. Electricity and frost-free water spigots are available in the campground year-round. Loop 1 offers basic campsites and Loop 2, Loop 3 and Loop 4 have electric campsites. Current nightly camping fees can be found through the Fees and Seasons link to the right; nightly camping fees effective can be found by clicking here. Reservations can be made by phone - 877-422-6766 from 7 a.m. - 10 p.m. CT seven days a week. For online reservations click site.